Engineered with reliability and functionality in mind Evolution's digital Splitter deliver superb RF performance for today's evolving cable networks. With quality as our primary objective, 100% of our Splitter are QC tested at the factory prior to being shipped. 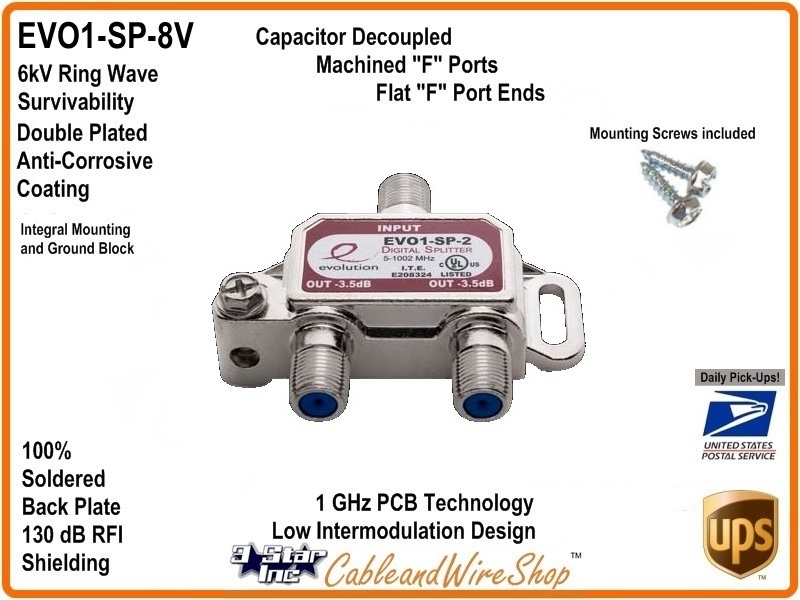 Our UL Listed Splitter are specially designed with raised bodies to provide more room for the installation of connectors and to allow moisture to pass behind the Splitter Instead of trapping moisture on the back plate. The unique manufacturing process used to make our digital Splitter eliminates parting lines on the Splitter ports, which are a source of moisture migration. Patented, enhanced conical seizure mechanisms are used in all Splitter to maximize contact surface and center conductor retention. The zinc die cast housings and back plates are plated using a proprietary multilayer nickel plating process that offers excellent corrosion protection. All back plates are soldered to ensure a hermetical seal and RFI isolation.